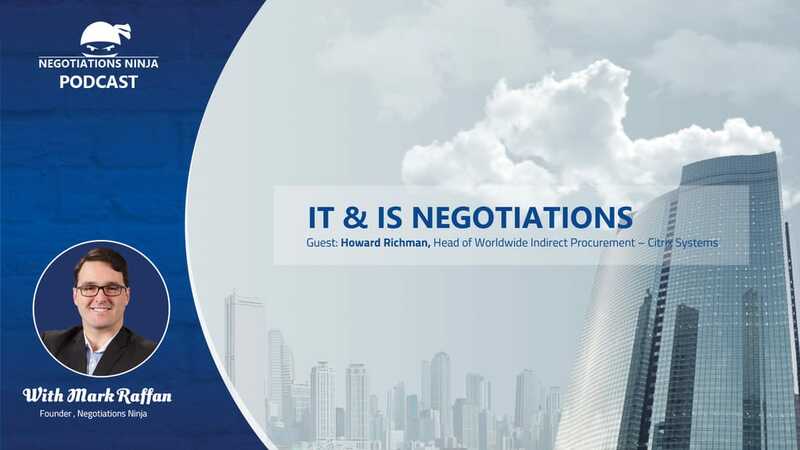 ​Howard Richman is the head of global indirect procurement at Citrix Systems. He has developed, negotiated, and executed category strategies for pretty much every indirect category you can think of. Howard has presented at IACCM on both software negotiations and how to run a legal services procurement category. He has led numerous round tables at Procurement Leaders at Marcus Evans CPO events, and was a recent keynote speaker at the Procurement Leaders on procurement transformation. I’ve been wanting to have this conversation with him for some time, and we focused our discussion on procurement negotiations within the IT and IS space. As ample forewarning on this one, we touched on a few legal concepts, but we are not lawyers. Obviously, don’t take our word as the gospel truth for any legal concepts that we talk about. Please seek qualified legal counsel if you need help with legal issues around agreements that you’re negotiating.